Loving food and the joy it brings. Exploring it, enjoying it and sharing it with others. It is no secret that I love sweet potatoes. Roasted with garlic and onions is probably my favorite, second only to a good sweet potato fry. But this weekend, after munching on a bag of Terra Chips, I decided it was time to go for the sweet potato chip. I’d tried them fried before, but given that we are still fairly close to the beginning of this new year, a healthier option was on the agenda. Baked sweet potatoes chips are surprisingly easy. The hardest part really, is paying enough attention to them so they don’t burn. This is perfect for a quick afternoon snack, or when you want to put a bit more effort into your party snacks than just opening a quick bag. Trust me, your friends will thank you! Preheat your oven to 400 degrees. Scrub the skin of the potato to remove all dirt, and pat dry. Using a mandolin, slice the potato to 1/8 “. Once sliced, toss in a bowl with a drizzle of olive oil and a healthy pinch of kosher salt. 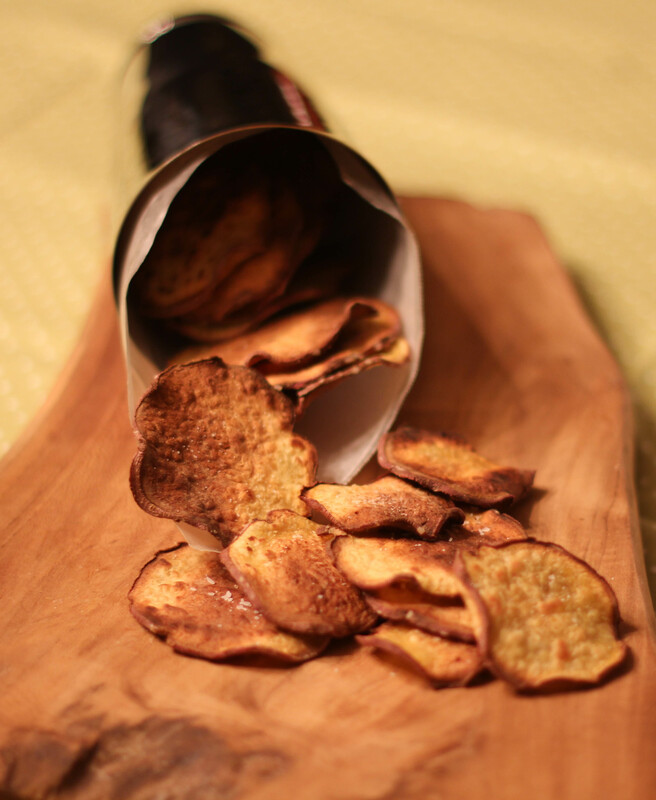 Use only enough oil to lightly coat all of the chips, they should not be dripping. Lay the chips out in a single layer on a foil lined baking sheet. Bake for 25-30 minutes, flipping the chips over at about the 12 minute mark. Keep a close eye on the chips from the 20-30 minute mark, flipping as needed and removing chips as they have reached maximum chip potential. The chips should brown slightly, and be stiff to the touch. Remove chips to a cooling rack and sprinkle immediately with more salt.